[Great work in frigid areas] | Denyo Co., Ltd. The pipelines connecting Russia and surrounding countries are used for energy resources such as crude oil and natural gas, and have become an important lifeline for the countries of Eastern Europe as a whole. In terms of scale, the Druzhba pipeline, which is the trunk line, alone extends to a total length of 4,655 km.As one would expect of equipment laid in a harsh natural environment, maintenance is essential to keep the pipelines in stable operation. However, maintenance can only be carried out in winter, when temperatures plunge to levels that defy imagination. Because many of the pipelines are laid in wetlands, it is only during periods when the ground is frozen that construction vehicles can go in. In this frozen land where there are no homes for hundreds of kilometers, operators in charge of maintenance spend several months continuously searching for and repairing problem sites on the pipeline. 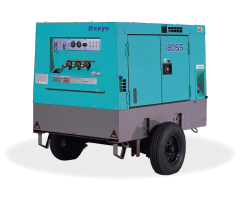 In these harsh conditions, it is Denyo’s engine-driven welders that live up to the trust placed in them by the operators. 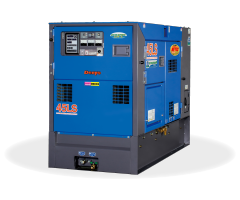 In addition to a rugged design that keeps breakdowns to an absolute minimum, Denyo welders are fully equipped to handle condensation, so the engine almost never stops working due to freezing up even in regions of most severe cold. 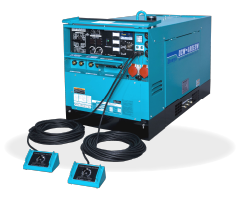 Even at 24-hour, full-capacity operation, Denyo welders continue to deliver stable performance. If a welder breaks down, work comes to a halt and hundreds of kilometers must be traveled in order to obtain replacement equipment. That is why the toughness of Denyo products makes them an indispensable presence in pipeline maintenance. Denyo has supplied approximately 3,000 machines to Russia’s Gazprom and Transneft pipeline projects since 2008. Even in Russian frozen winter, Denyo engine welder never betray trust of users.